A French company that specializes in bringing clients up close and personal with the Tour de France welcomes amateur cyclists and even couch potatoes on customized tours inclusive of VIP access to this yearly cycling competition. These non-cycling adventures include the best action viewing sites along with champagne at a team time trial at the finish July 3 at Les Essarts and a village gathering with former teams and tour officials on July 4 at Olonne Sur Mer. The grand final in Paris to the Tour de France is usually just a celebratory ride into the capital by the peloton as the general classification winner is usually determined by this stage. However, winning the sprint on this final stage is a very prestigious win for any pro rider who can survive to the end of the race and so viewers are in position to watch an exciting finish every time. Discover France Adventures has been organizing bicycle tours and hiking tours in France since 1994 and has offices in both the USA and in France. Discover France Adventures award winning tours are made up of their unique self guided tours and very competitively priced guided tours. They are proud to be a continued supporter of Sustainable Travel International. ExperiencePlus! Bicycle Tours, who in 1972 became the first North American travel company to offer pedal tours in Europe (http://www.experienceplus.com/), offers early booking incentives for its 2012 Latin American bicycle touring season beginning November 2011. Savings are $200 per person for booking by Aug. 1, 2011, bicycling opportunities in Latin America including Costa Rica, Argentina and Chile. ExperiencePlus! Bicycle Tours has cycled the region for over 15 years and offers eight bicycle tours and two multi-sport vacation opportunities where one can enjoy temperatures in the 70s December through February. Costa Rica programs include shorter six or seven day options, all beginning on Saturdays in San Jose and ending there as well. Bike, Hike and Paddle multi-sport (7 days for $2,295 per person, double / $500 single supplement) tour includes some of the company�s favorite rides in Costa Rica, white water rafting on the legendary Pacuare River, hiking through the rain forest with a local naturalist, and the chance to watch Arenal Volcano spew lava rocks (from a safe distance). The extended version or the Plus! tour (9 days for $2,995 per person, double / $600 single supplement) extends the fun for two additional days and includes an outrigger canoe trip on the Pacific, and hiking along the beaches and tropical forest of Manuel Antonio National Park. The last two nights are on scenic and isolated Esterillos Beach. The 6-day Bicycling Costa Rica ($2,365 per person, double / $500 single supplement) and extended 9-day Bicycling Costa Rica Plus! the Pacific ($2,995 per person, double / $600 single supplement) have all the great cycling as well as a zip line canopy tour, a float trip to see monkeys, crocodiles and a wide variety of water birds, a hike in the El Silencio Rainforest Reserve and an evening hot springs soak. The Plus! trip continues to the Pacific Coast and Playa Carrillo, one of the most beautiful and unspoiled beaches in Costa Rica. Northern Argentina has a growing international reputation as the next adventure travel hot spot. Discover Northern Argentina (8 days at $3,350 per person, double / $500 single supplement) follows quiet roads and ever-changing scenery including an optional ride up to 13,000 feet, and other routes through rain forests, vineyards and canyons with stunning rock formations. The 12-day Plus! trip at $4,495 per person ($600 single) includes a visit to Quilmes, the most famous ruins in Argentina, and a day off in Cafayate, an up and coming Argentine wine town. Shuttles are to and from Salta, well connected from Buenos Aires. Wrapping Argentina and Chile together is Bicycling Patagonia�s Lakes District. Two tours, (an 8 day trip for $3,450 per person double / $500 single) and the Plus! version adding Chilo� (11 days at $4,495 per person, double / $600 single) begin in the mountain resort town of San Carlos de Bariloche in Argentina and travel west over the Andes (a low pass!) into Chile encompassing mountain vistas, lakes, snowcapped volcanoes and charming small towns. The Plus! version includes Chilo� Island, an archipelago accessible only by ferry, for observations of penguins, colorful stilt houses and hundreds of species of animals and plants endemic to Chile. In Chile an 8 day at $3400 per person and 11 day at $4395 person Bicycling Chile�s Wine Country tours begin and end in Santiago, traversing the Maule and Colchagua wine valleys of central Chile to look at historic vineyards, colonial cities and secluded beaches. Highlights are Santiago, Santa Cruz, the Central Valley and a stay at a vineyard in the Colchagua valley. Overnights include off-the-beaten-path wine hotels and a rest day in bustling Santa Cruz. Wines here include Cabernet Sauvignon and Sauvignon Blanc, and of course the prized Carmenere �one of the oldest European varietal grapes and once thought to be lost when all the vineyards in France died from the Phylloxera plague. It was then �re-discovered� in Chile where it had been brought over by French vintners. No North American company has been running European cycling tours longer than ExperiencePlus! Bicycle Tours (http://www.experienceplus.com/). Launched in Italy in 1972 the Colorado-based company now offers global cycling tours immersed in local character to 20 countries on five continents. Throughout the years as the business and industry have evolved, ExperiencePlus!� roots as a family business have remained strong. Authentic, experienced, self-paced and engaging were the ethos of parents Rick and Paola Malpezzi Price which have now been passed down to their daughters and current directors Monica Price and Maria Elena Price. Standing behind their beliefs, ExperiencePlus! is the only adventure cycling company that issues a 10-point Customer�s Bill of Rights outlining what clients can and should expect while pedaling on a company tour. Their cultural cycling programs engage tour leaders who are expert cyclists and trained cultural interpreters, guiding guests on innovative routes and immersing them in off-the-beaten-path experiences. Tours in 2011 go to Argentina, Australia, Austria, Canada, Chile, Costa Rica, Croatia, France, Greece, Hungary, India, Italy, New Zealand, Poland, Slovakia, Spain, Turkey, United Kingdom, USA and Vietnam. ExperiencePlus! is a 2011 and a 2010 recipient of National Geographic Traveler magazine�s 50 Tours of a Lifetime. The 2011 issue also featured Maria Elena Price and Monica Price, co-owners, among its Top 10 Tour Guides. Recognized for her visionary work within the industry, Monica Price has been named to the Adventure Travel Trade Association Advisory Committee for the 2011 Adventure Travel World Summit to be held October 17-20 in San Crist�bal de las Casas, Chiapas, Mexico. Spectacular fall colors, incredible train excursions and delightful destinations are hallmarks of Vacations By Rail�s autumn rail tours. Autumn is a perfect time of year to travel. Temperatures are moderate, the crowds of summer vacationers have dissipated and the scenery in many parts of North America are bursting with vibrant colors. These annual displays of nature are the basis of many of Vacations By Rail�s popular autumn rail tours�where the only things more brilliant than the fall colors are the scenic train excursions that take travelers through the spectacular scenery. One of the premier autumn travel destinations is New England, renowned for its spectacular red, orange and gold foliage on display. Fall foliage rail vacations visit popular New England sights like Boston, Mystic Seaport, the Breakers mansion, White Mountain National Forest and Cape Cod and include spectacular train excursions throughout the region including the Mt. Washington Cog Railway, the world�s first mountain-climbing cog railway with some of the steepest railway tracks in existence, the Conway Scenic Railroad, the Cape Cod Central Railroad, and the Essex Steam Train, among others. Some tours, like the 8-day fall foliage favorite New England Rails and Sails, also include scenic lake and harbor cruises, which offer a unique perspective on the stunning colors. Travelers wishing to double the amount of fall colors in their autumn vacation need not look further than the dual-country Fall Colors of Quebec & Vermont tour. Highlights of this 8-day U.S.-Canada itinerary include travel aboard the vintage Montreal Limited from New York to Montreal, VIA Rail from Montreal to Quebec City, an excursion along Lake Champlain aboard the Champlain Mountain Flyer and Amtrak�s Vermonter to New York as well as sightseeing in Montreal, Quebec City, Burlington and Stowe. While leaf-peepers generally flock to New England, fall colors can be found throughout the Midwest states and the Smoky Mountains with popular rail vacations to match. Fall foliage rail vacations start at $1,698 land-only, per person based on double occupancy. All tours have limited departure dates due to the short window between late September and mid-October when the colors are at their peak. To book your fall foliage rail vacation, call a Vacations By Rail travel specialist at 877-929-7245 or visit www.vacationsbyrail.com. A new, first-of-its-kind comparison calculator, created by the budget and coupon folks at BeFrugal.com, helps travelers take the mystery out of deciding whether to fly or drive. Travelers input the location and date details for their trip, then the Fly or Drive Calculator does the rest � comparing the cost and time of traveling by auto or plane. If you're interested in talking with the folks who created the Fly or Drive Calculator, please let me know. The Fly or Drive Calculator. Fly or Drive Calculator news release. BeFrugal's blog post about the new calculator. Fly or Drive Calculator FAQ. Learn more about BeFrugal.Connect with BeFrugal on Facebook or Twitter. American drivers love to spend their vacations hitting the open road. AAA anticipated nine out of 10 travelers over the recent Memorial Day holiday weekend took a road trip as opposed to traveling by plane, train or other mode of transportation. For those in the market for a new vehicle that they hope to log plenty of miles in while traveling, AAA has released its top vehicle picks for road trips. �Since the invention of the automobile, Americans have enjoyed taking road trips. From wood-paneled station wagons to oversized conversion vans, most Americans have grown up taking road trips with their family and friends,� said John Nielsen, AAA National Director of Auto Repair, Buying Services and Consumer Information. �Today�s American road trips come in many different forms: family vacations, mancations, girlfriend getaways, romantic excursions and more. And the ideal vehicle for a road trip can come in as many different forms depending on where you want the road to take you and who will be joining you for the ride,� said Nielsen. To assist travelers seeking the ideal vehicle for their road trip, AAA Auto Buying experts developed a list of its top picks for road trips taking into consideration a wide variety of factors such as interior comfort, cargo size, passenger room and comfort, fuel economy, safety, vehicle performance and handling as well as other factors. Chevrolet Cruze Eco � From the Cavalier to the Cobalt to the Cruze, each generation of compact Chevrolet vehicles has been an improvement from the previous, and the Cruze is no exception. AAA Auto Buying experts tested the �Eco� version with a six-speed manual transmission, which is the non-hybrid gasoline fuel economy leader in its size category. It also received a five-star overall rating in the National Highway Traffic Safety Administration�s (NHTSA�s) more stringent new crash test program. AAA found the Cruze Eco to be a good value with impressive fuel economy, making it a smart pick for road trip lovers on a budget. For those looking to take more than two on their road trip, the Cruze lacks rear cup holders and a center armrest, and the rear seat may be cramped for tall passengers. The TrueCar national average selling price of the Chevrolet Cruze �Eco� is $18,837, 1.8 percent (or $338) less than the MSRP. Ford Focus � A definite improvement over the previous version, the new 2012 Ford Focus drives very nicely with above average ride and handling. Fuel economy and engine performance also are very good and highway cruising is impressively quiet for the small car field, making it a top pick for road trips. As with other cars in the category, its ideal for two travelers as the backseat can be a bit cramped. The TrueCar national average selling price of the 2012 Ford Focus is $16,896, 2.3 percent (or $399) less than the MSRP. Kia Soul � For those looking to express themselves a bit more while on the road, AAA Auto Buying experts like the funky looks of the Kia Soul and its practicality, as well. Reviewers found little to fault with the Soul, which offers a 10-year/100,000 mile warranty, 30-mpg fuel economy and is a Top Safety Pick from the Insurance Institute for Highway Safety (IIHS). The Soul also received a five-star crash test rating from NHTSA. The TrueCar national average selling price of the Kia Soul is $16,759, 2.5 percent (or $431) less than the MSRP. Ford Fusion � The Ford Fusion is a well-rounded vehicle. Its engine performance, ride and handling are all very good, and the hybrid version can produce exceptional fuel economy. As an added bonus, all-wheel drive is an option, which should make the car more appealing for those who enjoy winter-time road trips in certain parts of the country. The downside found by AAA Auto Buying experts is the four-cylinder engine could be more refined. The TrueCar national average selling price of the Ford Fusion is $18,821, currently selling for 8.8 percent (or $1,824) less than the MSRP. Toyota Prius � The Toyota Prius is a road trip top pick because it�s roomy, comfortable and economical. The hatchback design makes for exceptional flexibility, as well. The hybrid drivetrain sips fuel, and with careful driving, it can push fuel economy well past 50 mpg. However, for those who love engaging and sporty vehicles for their road trips, the Prius may not be the right choice. It�s a secure and predictable ride, but not engaging to drive. The TrueCar national average selling price for the Toyota Prius is $24,876, which is 2.5 percent (or $596) above the MSRP. Increase demand due to higher gas prices and lowered supply of the Prius make it the only vehicle on AAA�s list currently to be selling for more than its MSRP, according to TrueCar pricing information. Hyundai Sonata � AAA Auto Buying experts found the Hyundai Sonata to be an excellent performer from any perspective. The ride is comfortable and controlled, the handling is highly predictable and the four-cylinder engine delivers both good performance and good fuel economy. For those planning a road trip with taller passengers in the back seat, the swooping roof cuts into the rear seat head room as well as rear visibility. The TrueCar national average selling price for the Hyundai Sonata is $20,572, 2.7 percent (or $573) less than the MSRP. Toyota Camry/Avalon � These cars share a platform and a V-6 engine. The Camry also offers four-cylinder power, which should be sufficient for most drivers. The cabins are roomy with the Avalon offering exceptional rear seat comfort, good for those taking multiple passengers on a road trip. Fuel economy with the V-6 when on the open road is surprisingly good. While both have solid handling, neither car is engaging to drive for travelers seeking a little extra from their driving experience. The TrueCar national average selling price for the Toyota Camry is $20,668, 6.1 percent (or $1,337) less than the MSRP. Chrysler 300/Dodge Charger � Much improved for 2011, the Chrysler 300 and Dodge Charger (built on the same platform) offer a surprising amount of room, a comfortable and well-controlled ride and good handling. Interior treatments are noticeably upgraded, as well. The new 3.6-liter V-6 engine provides adequate power and reasonable fuel economy. However, AAA Auto Buying experts report rear visibility is still an issue though forward visibility for overhead traffic lights has been improved from previous model years. The TrueCar national average selling price for the Dodge Charger is $24,803, 5.4 percent (or $1,417) less than the MSRP. Infiniti G37 � AAA Auto Buying Experts agree the Infinity G37 is one of the most engaging driving experiences with sharp handling and a powerful 328-horsepower V-6. It also comes loaded with standard features and excellent safety ratings. For road trippers, the interior is a bit snug and the ride might be too firm for some depending on their personal preference and road surface conditions. The TrueCar national average selling price of the Infiniti G37 is $33,894, which is 7.6 percent (or $2,801) less than the MSRP. Honda Odyssey � The Honda Odyssey is big, but the driver does not have to put up with an unwieldy vehicle as its handling is surprisingly good. As for space, this minivan can carry a large family with ease. Optional split-screen entertainment also can keep rear seat passengers entertained during long trips. The TrueCar national average selling price for the Honda Odyssey is $30,777, three percent (or $953) less than MSRP. Toyota Sienna � Big, comfortable and inviting, the Toyota Sienna has many features to put it on the top picks for road trips list. The ride is comfortable and quiet while the V-6 engine performs impressively. AAA Auto Buying experts reported that the Sienna�s handling is not the best in the class and the interior is not as polished as some road trip fans may prefer. The TrueCar national average selling price for the Toyota Sienna is $24,209, 6.4 percent (or $1,661) less than MSRP. Chrysler Town & Country � Much improved with a mid-cycle freshening, the Chrysler Town & Country comes with a standard array of useful safety features including a backup camera and cross traffic and blind spot alerts. The Stow �n� Go seats are unparalleled for convenience and the ride and handling are quite good in the new model. The Town & Country can be a great pick for those traveling with children, however the second row seats still are not very adult friendly. The TrueCar national average selling price for the Town & Country is $28,696, 7.7 percent (or $2,399) less than the MSRP. Dodge Durango � The new platform for the Dodge Durango, which it shares with the Jeep Grand Cherokee, is very good. Its ride and handling are well above average, and the new 3.6-liter V-6 is more than capable of delivering power when needed. Rear seat room is up to the challenge of handling six-foot passengers. The main drawback to the Durango is its below-class-average fuel economy. The TrueCar national average selling price for the Dodge Durango is $27,347, nine percent (or $2,698) less than MSRP. Subaru Forester � Easy to drive, comfortable and budget friendly (at least in its basic, though still well-equipped trim levels) the Forester is ideal for longer trips. Its ride and handling are good, and the base engine performance is more than sufficient for family use. The only downside is its fuel economy is average for the vehicle category. The TrueCar national average selling price for the Subaru Forester is $21,513, 5.3 percent (or $1,207) less than MSRP. Toyota RAV4 � Good ride, good handling and good room make the Toyota RAV4 an excellent extended drive vehicle. The V-6 is much more powerful than the four-cylinder motor, yet fuel economy seems not to suffer much with the upgrade. One downside noted by AAA Auto Buying experts is the location of the rear door hinge at the side, rather than the top, which can complicate access to the cargo area. The TrueCar national average selling price for the Toyota RAV4 is $22,150, 4.9 percent (or $1,135) less than MSRP. Porsche Boxster/Cayman � There are few cars that offer a better blend of handling and engine performance. The Porsche Boxster and Cayman are not the fastest, but they are quick enough to be thoroughly entertaining on a road trip�especially those that might include some winding roads. As with most the �fun� picks, there is only room for two, and the Porsches� split trunks limit packing options. The TrueCar national average selling price for the Porsche Boxster is $47,022, 4.1 percent (or $2,028) less than MSRP. Chevrolet Corvette � Great handling and power are the highlights of the Chevrolet Corvette that can make it a fun car for a road trip. As with other sports cars, travelers will need to pack light and leave the kids at home for road trips in this American classic. The TrueCar national average selling price for the Chevrolet Corvette is $45,156, 9.7 percent (or $4,839) less than the MSRP. Volkswagen GTI � The Volkswagen GTI may be the best overall compromise in the �fun-to-drive� category. It is roomy enough to be practical, while the ride is surprisingly supple considering its handling. The interior is nicely designed and put together. While a good compromise of room and fun, the back seat is still a tight fit for adults if taking a longer road trip. The TrueCar national average selling price for the Volkswagen GTI is $26,187, 5.3 percent (or $1,478) less than MSRP. AAA�s top picks are selected by its AAA Auto Buying experts who test drive and evaluate hundreds of vehicles each year. AAA provides free vehicle reviews, localized pricing information and more for consumers online at AAA.com/AutoMaker. Additional information on AAA Auto Buying is available at AAA.com/AutoBuying. TrueCar is the AAA preferred supplier for new car pricing data for the motor club. TrueCar is a trusted source for car buyers and car dealers, providing what other people actually paid for a vehicle within the last 30 days, locally, regionally and nationally using multiple, and even duplicate sources to gather and authenticate their data. Those in the market for a new vehicle can configure the vehicle they want and get the TrueCar average selling price at AAA.com/AutoMaker. Vehicle pricing will vary based on trim packages, and prices included with the top picks are based upon specific trim. As North America�s largest motoring and leisure travel organization, AAA provides more than 52 million members with travel, insurance, financial and automotive-related services. Since its founding in 1902, the not-for-profit, fully tax-paying AAA has been a leader and advocate for the safety and security of all travelers. AAA clubs can be visited on the Internet at AAA.com. 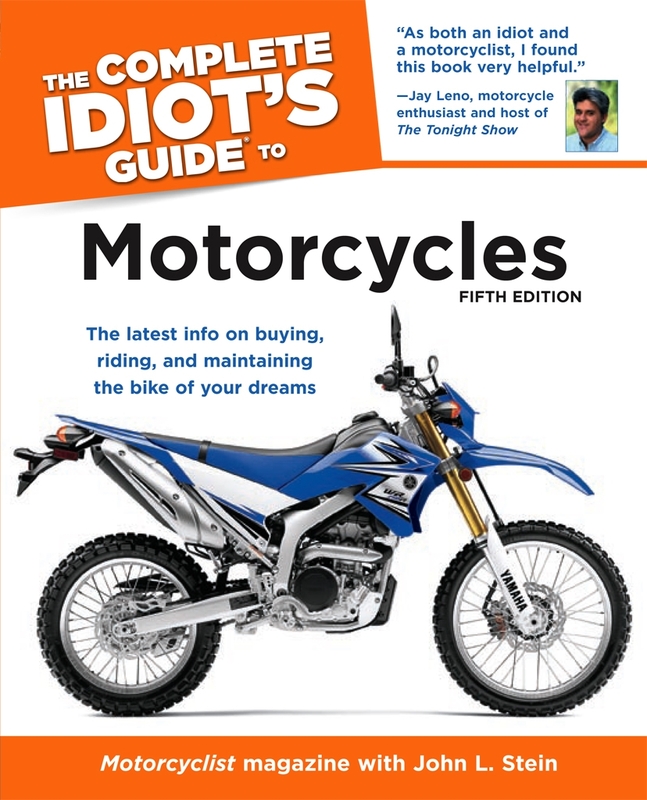 Jay Leno adds his twist on this fun guide to motorcycles, in its fifth edition.